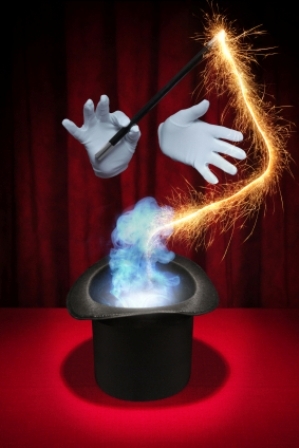 This is a great silk routine that uses four silks and is great for some magic with story telling. This routine has lots of twists and turns in the story that will evince a lot of audience participation with plenty of opportunity for comedy. You show a large 18â€� x 27â€� picture of a house that is ready for Christmas and is waiting for Santa to deliver the presents. 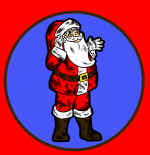 You have a volunteer to hold out the silk while you introduce a 9â€� x 9â€� picture of Santa with a bag of presents. You show that Santa climbs down the chimney and disappears into the house. You pretend to wait for Santa to come down the chimney but there is no trace of Santa anywhere. You frantically look all around the house for Santa but there is no trace of Santa. It then dawns on you that you maybe Santa is stuck in the Chimney. You jiggle the house to make Santa break free from the Chimney and you reach into the house and produce Santa from the house, but something strange has happened. 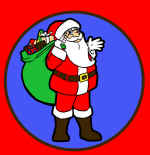 Santa is all sooty from the soot in the Chimney and he is missing his bag of presents. Now, we are happy to see Santa out of the Chimney but the presents were something we were also looking forward too. So you look around for the bag of presents and finally produce the bag of presents from the Volunteerâ€™s ears or shirt or any place else. 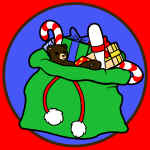 You can then place the picture of the bag of presents in a change bag and bring out a real present that you can give away to volunteer. This is a great routine that will run you a good 5 â€“ 6 minutes. Since the Volunteer is holding onto the large silk your hands are free to do all the magic and gestures and comedy. The pictures are very well designed and are very kid friendly. If you do any kid shows you will love this one. 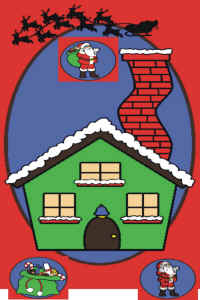 This Santa in Chimney packs flat. Well it will even fit in your pockets and can be performed on a stage or even when you are completely surrounded.